Hi guys! Welcome back to the FROM JAPAN YouTube channel. I'm Haley and today we're going to be doing another unboxing for you guys. So, FROM JAPAN—as you know—We help you buy things from Japan that can be difficult to get on your own and this is kind of an example of something that you could receive. Now, we do these themed unboxings just to show you the kinds of things that you can get and today's theme is Sumikko-Gurashi and I'm sure you've seen these characters. They're really, really popular in Japan and they're super, super cute. So, let's take a look inside this box. Now, this is the kind of box that you would receive. Everything comes packed very nicely. You can just pull it out, kind of like this. In this case, we've got everything all sealed together and some extra bubble wrap. Ooh! Okay, this looks fun. 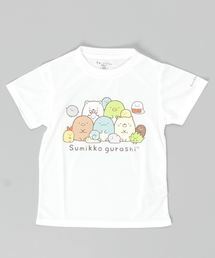 So, we actually have a Sumikko-Gurashi t-shirt and I'm actually going to go change into this to continue our unboxing so that you can kind of get a feel for what it looks like on. Be right back! Okay, here it is! So, I think it's really, really cute. It's got the little Neko—the little cat from Sumikko-Gurashi—on the pocket here. And I love this pink color. Some of the characters are down here and they look really cute. So, I would definitely recommend this one. This was our first item: the pink t-shirt. So, this next item is—it looks like a cup. Here's a little preview, so… It even has designs on the inside and the designs go all the way around the inside and on the bottom. So, this is really nice and it's a very durable material. So, I think, even if you drop it, it's not going to break or anything. 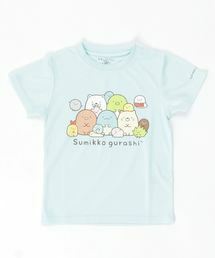 If you're a Sumikko-Gurashi fan, this would be so cute to have in your house. A lovely secret box. This is what the packaging looks like and it kind of gives you a lot of ideas of what you could do with it. So, here's the top of the box and you've got the Tonkatsu, and the Pengin, Shirokuma, and Neko all together and it looks like they're coloring. It's so cute. Now, the box has this kind of raised edge. So, that's really nice for storing things on the top. So, you can actually store things up here and they won't fall off of it. We actually have kind of a switch here, as you can see. So, that's going to be a little extra security for you. And you can open it, like this. Aw, it's so cute! Oh, it has stuff inside! I didn't even realize. It has, like, all of the stuff inside it already. So, it has a hair tie, a really adorable lock and key, a memo pad—so, this is really adorable, here's the back. It just has little notebook paper, like this, and it's so cute—and a pencil. So, you get the little pencil to go with the notepad. Oh, there's stickers! So, you also get some stickers. The inside of the box is just really adorable. You can see, you have, like, a heart-shaped mirror right here and then the illustrations on the inside are just so cute. And you also have a drawer down here. Let's take a look. Okay, so in this bottom drawer, you have some sticky hearts—like, some decorative little heart stickers—and then, more memo paper, but it's the kind of paper that you can fold and, like, write a little note to someone and kind of seal it with the heart. That's adorable. And a little Sumikko-Gurashi comb that's heart-shaped! And this is what the bottom drawer looks like, so it's really cute. It even has little details like this on the side. It's really covered in art and everything is so cute. Here's the picture on the bottom. So, it's a really useful kind of box and you can really store anything in here. You could store jewelry in here. You could put art supplies or really whatever you want in here, so I would recommend this as well. You could have a cute little charm that looks like this, with the Sumikko-Gurashi characters on it. And it's actually a buzzer, so you can—When you receive it, you would just pull this little clear tab from the back and then you can use it to just make a very loud sound when you—if ever you need to. You know, it's kind of, like, an item that makes you feel safer and you can get one that's really cute and features your favorite characters as well! I'm going to demonstrate the buzzer for you. It comes with a little plastic thing for the battery that you pull out. To activate the buzzer, all you do is pull. Now, I'm going to pull this and you can hear what the buzzer sounds like… That was really loud! Okay, I hope I didn't alarm everyone in my office just now, but that was the buzzer. We demonstrated the buzzer. Now, the way that I deactivated it was just to push it back in. So, you can see… You pull and when this white part comes out, the buzzer will go off. You just shove it back in to make it stop and it's loud, as we've just discovered, so… It's really useful if you just want something that makes you feel safe. And we also have some stamps. So, this is what the packaging of the stamps looks like—adorable. This was a really good deal. It, like, a set of little stamps and… I mean, if you're a teacher or something, these would be especially useful—or a student, but even if not, I think anyone can appreciate really cute little stamps. We have eight stamps in here and it comes with a stamp pad, a red stamp pad. So, let's take a look at these. And the phrases on here are in Japanese, so it feels very authentic and cute. So, okay, I just sampled a few of them. These are all the stamps that it comes with. Our last item is going to be something really fun: a sparkly snow dome! This is, like, a proper activity you can do and it comes with all the parts that you need. So, here's the front of the box. Here's the back. And we're going to try and make some of these snow domes! You can—Here's an example of what kinds of things you can make and then, this is what the kit looks like at first. Aw, the little figures are so tiny and cute. We've got rings that you can make. There are a couple of necklace options and some bracelets and then just some decorative little figures. Now, these are just the base. You make a little snow globe that goes onto these, as you saw on the front of the box. So, let's attempt to make a little teacup! We're going to start with this little pink teacup. Now, first you grab the “dome-maker,” I'm going to call it, and you take one of the plastic domes and just put it here. It also comes with these bases that go into the item that you're making, so—and they come in different colors. There's green, pink, yellow, and blue. We're going to go with the pink for the teacup, so you just put this onto here and now we're getting somewhere. So, next, you're going to choose from your characters. Which character do you want inside the snow globe? They're very tiny and cute. So, you have quite a few to choose from and, today, let's go with these little guys. I always thought these were really cute. Okay, so, you put this on the base, like that. So, that's where we are. Oh, we filled our little bottle up with water. You have these parts in the set. Now, these are little plastic shapes—really, really cute—and then, these are kind of, like, glitter bombs, you can think of—like, glitter tablets. Go ahead and add these into the dome. So, we're going to add one glitter tablet and some of these little charms into our dome. Now, I don't want to put too many. Now they're in there. Can you see? All we have to do is fill it up with water, so… Okay, so, now I'm going to close it, but it has this little pool around it. It has this little, kind of, moat around it. So, I guess, if you put too much water, it's not going to destroy it or anything. Okay, we've got to squeeze it shut. Is it…? Okay, let's see. Oh, we did it! Cool! Probably not the best, but it was my first try. Now, if you look closely, you can see that the glitter tablet has not broken up yet. Now, you just shake it and the glitter will disperse. Okay, and so, all you really do is put it in this teacup and this is what we end up with: super-cute little Sumikko-Gurashi snow globe. Stuff like this is so cute because you get to have a little fun activity. So, you could do it with your friends or you could do it with a kid that you know and it's just really fun and you get to do something special that's from Japan and something that you can make a memory with. And we're going to try to do one more. So, we made the teacup. Let's try and do a bracelet. Will this bracelet fit me? Okay, it barely fits, so we're going to try and make this bracelet. And it looks like it has a yellow base and then it's got this really cute blue band with hearts on it. So, let's take a yellow base and place it here one more time. We need another dome. Let's make the Neko! It's yellow, so it'll match. It's so tiny! He's eating a little rice ball—a little onigiri. Okay, put him on here… Add the little plastic stars and hearts and music notes… And throw in a glitter tablet. Now, I'm not going to be afraid to use the water because I realize now that there's a moat, so… Okay, we added the water and… Okay, that was much better. Okay, here he is fresh out of the dome. You can see, the glitter, again, is not… Shake the glitter. Now the glitter is all dispersed and that's what he looks like. So, let's pop him into our bracelet. It's so easy! This is such a cute thing to do with kids and all you need is water, so why not? It's safe, it's memorable… You get a cute little trinket out of it. So, that does it for our Sumikko-Gurashi unboxing. Let's go through our items one more time: The Sparkly Snow Dome Maker, that was really fun… A really cute little stamp set that looks like this. We have a really adorable cup. Don't forget about the cup! Our box… I really want this, like, it's so cute. Buzzer! I imagine it's very effective because it's so loud. Okay, so we have the buzzer and, of course, we have this t-shirt that you've gotten to admire the whole video. And that does it for our Sumikk-Gurashi unboxing. So, if you like anything, please check it out. If there's anything else that you want to see us unbox, let us know. We love doing these themed unboxings, and… Just let us know in the comments what you enjoyed and what kinds of things that you're looking forward to buying from Japan. Again, I'm Haley, and I'll see you in the next one. Bye guys!